In a couple sentences several of the symbols and patterns we look for to initiate or enter a position occurred recently in the Dollar Index. In this case, the sensitive “buy stop” level was 97.000. The index was trending up slightly but the “delta”, the difference between upticks and downticks, remained negative. The shorts were just “taking it all in”. Positive sentiment remained so the dollar shorts, be they nimble or as we believe in the long term correct that the dollar will decline. are inclined to limit their losses. As the 97.000 level was approached our proprietary “orange cell” appeared; I often call it a pivot point or a fulcrum as well. We put in a sell limit at 97.025 and waited. It did not take long. As evidenced in the lower orange area, an explosion of volume at this tipping point occurred and all of it on the upside. 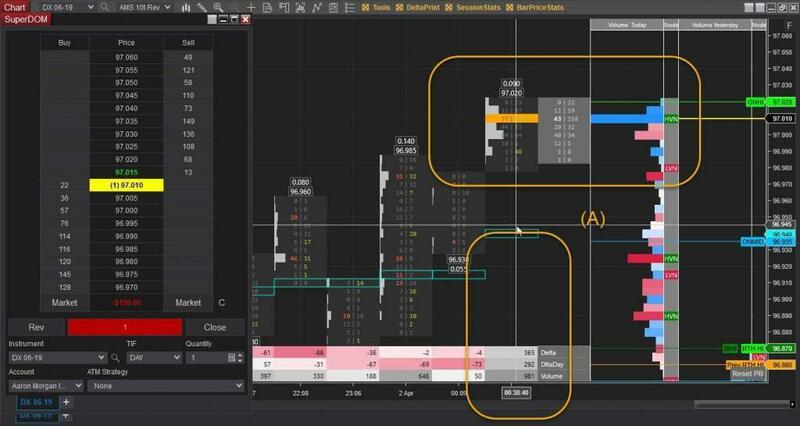 Sell limit triggered by the exhaustive buy side reaction most of which was caused by a concentration of buy stop orders to limit losses. Additionally with the buy side pressure reduced and a pocket of buyers above 97.000 “stuck” we held this position “overnight”. Keep reading folks and check out all that AMS is undertaking to teach you how to use out tools. If you want to find out more about AMS tools or the tutorials email us at support@amstradinggroup.com. Feel free to email me at thewizard@amstradinggroup.com as well. There may be a few bits and piece of information that can be imparted upon you from an individual with 50+ years of experience. You decide.